Many things can affect your child’s future dental health: oral hygiene, diet, or habits like thumb sucking or teeth grinding. But there’s one you might not have considered: how they breathe. Specifically, we mean whether they breathe primarily through their mouth rather than through their nose. The latter could have an adverse impact on both oral and general health. 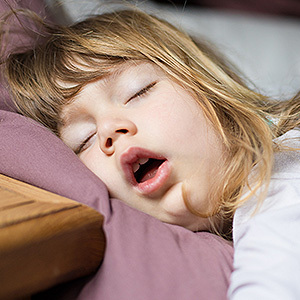 If you’ve noticed your child snoring, their mouth falling open while awake and at rest, fatigue or irritability you should seek definite diagnosis and treatment. Chronic mouth breathing can cause dry mouth, which in turn increases the risk of dental disease. It deprives the body of air filtration (which occurs with nose breathing) that reduces possible allergens. There’s also a reduction in nitric oxide production, stimulated by nose breathing, which benefits overall health. Mouth breathing could also hurt your child’s jaw structure development. When breathing through the nose, a child’s tongue rests on the palate (roof of the mouth). This allows it to become a mold for the palate and upper jaw to form around. Conversely with mouth breathers the tongue rests behind the bottom teeth, which deprives the developing upper jaw of its tongue mold. The general reason why a person breathes through the mouth is because breathing through the nose is uncomfortable or difficult. This difficulty, though, could arise for a number of reasons: allergy problems, for example, or enlarged tonsils or adenoids pressing against the nasal cavity and interfering with breathing. Abnormal tissue growth could also obstruct the tongue or lip during breathing. Treatment for mouth breathing will depend on its particular cause. For example, problems with tonsils and adenoids and sinuses are often treated by an Ear, Nose and Throat (ENT) specialist. Cases where the mandible (upper jaw and palate) has developed too narrowly due to mouth breathing may require an orthodontist to apply a palatal expander, which gradually widens the jaw. The latter treatment could also influence the airway size, further making it easier to breathe through the nose. The best time for many of these treatments is early in a child’s growth development. So to avoid long-term issues with facial structure and overall dental health, you should see your dentist as soon as possible if you suspect mouth breathing. If you would like more information on issues related to your child’s dental development, please contact us or schedule an appointment for a consultation.